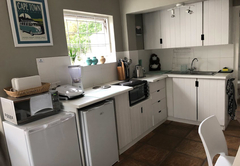 Little Arum Cottages is a property providing self catering in Kommetjie for up to 4 guests visiting the Atlantic Seaboard region. 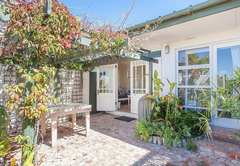 Little Arum Cottages provides accommodation for three adults and one child. 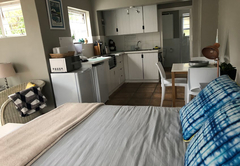 Located in the quaint seaside village of Kommetjie, with beach houses that date back to the 1900’s, this is a great place for a family getaway. 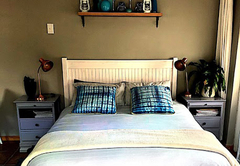 The self catering cottages are elegantly furnished with lightly colored furnishings. 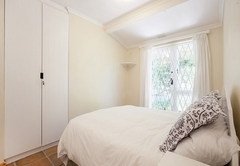 There is one bedroom furnished with a Queen-size bed and a double sleeper couch in the lounge. The bathroom has both a shower and bath. Bed linen and towels are provided. 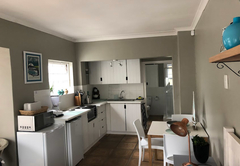 There is a comfortably furnished lounge and a kitchenette equipped with a bar fridge, microwave, toaster and oven with two plates and a grill. Braai facilities are provided on the patio. Kommetjie’s Long Beach is over 5 km of white sand and the beach has a protected tidal pool perfect for toddlers. 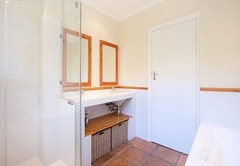 The Cape Point National Park is 35 km from the property.